Naheeda Sharmeen, a painter by training, is having her exhibition of saris and garments at Chitraneer (Gallery Chitrak), keeping Eid in mind. "Every year I've had only saris ; this year I've added 'shalwar-kameezes' and 'fatua' sets to the collection." The saris use a wide variation of combinations of block, hand-paint and crochet stitch. Machine stitch and embroidery are there too. This includes "karchupi" on the borders and "anchals". Sequins and beads have been added too. In the block, she has brought in the "alpana" motif plus geometrical designs. Keeping the current trend in mind there were also saris in burnt sienna, green and orange with crochet work . They contain "alpana" designs and crochet work in an artistic manner. There are more floral designs than the folk motif of the earlier exhibitions. There is the Comilla "taat" (handloom) sari. These saris have various shades of colour which include blue, green and orange. The motifs are highlighted by being outlined with black. 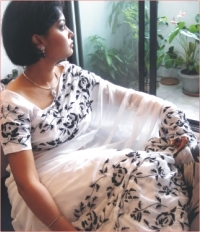 The Rajshahi silk saris contain heavy machine embroidery and block designs. These are in maroon (self striped), pale flamingo orange and white, and mauve. At times Sharmeen has even used self-coloured block. Frequently, we see sequins to keep with the current trend of the glitzy. Coffee colour and light cream saris are there for the conservative and older women. The borders bear blue, yellow and green "kantha" stitch along with block print. There are some saris which have been worked on with hand paint alone. The three piece sets contain machine and embroidery, block print , beads and sequins. The sides of the dresses have been left open to fit the individual sizes. There are short "kameezes" with "dividers" too. The "fatuas" are made using Comilla "khadi" and cotton from Naryanganj. These are mostly in pale mauve, gray and blue shades with geometrical block designs at the neck and border at the bottom. There are 150 saris, 60 "shalwar-kameez" sets and 90 "fatuas". Sharmeen has three helpers for her work apart from a tailor. Sharmeen has turned to making saris and garments as they make a good sale and are easy to store. However, she does miss her oil painting and hopes to arrange her schedule in such a manner that she can do her more creative work too. She says that her in-laws are very encouraging without which she would not have been able to be an entrepreneur. Exhibition will continue till the 14 October. Rupanjana, the house of exquisite saris, which once amused the sari connoisseurs in the mid eighties, is back again with its new medley of sari collections. Keeping in mind the festive season of Durga Puja and Eid, Rupanjana has decorated its saris with colourful floral motifs inspired from nature. In this connection, a five-day long show of saris will be held from October 10-14 at the boutique premises. The show will be open to all from 10am to 10pm. The 100% hand-embroidered saris by village girls are the special feature of the boutique and elegant roses and bright yellow sunflowers that are embroidered on each sari can easily be treated as artwork. In its latest show, Rupanjana mainly concentrated on cotton saris. But, one can order exclusive silk saris too. Apart from the show, the boutique will take orders of saris throughout the year. The venture that once started with only Tk.5000 is now a business worth over 2 million taka. Touhida Tohu, a self-made designer got herself into the dress making business back in 2003 with only tk.5000 as the initial investment. Today her business has expanded, employing around 40 permanent workers in her factory at Mohammadpur. Besides, approximately 300 women are working for her in the villages of Narsingdi, Dinajpur, Kushtia and Mirpur. The first outlet of Touhida Tohu was launched on the second day of this month. Inaugurated by Valerie A Taylor, Coordinator of the Centre for the Rehabilitation of the Paralysed (CRP), Tohu's Creations is the milestone on the long and difficult path that Touhida Tohu crossed in the last 2 years. A business that started with supplying made-to-order clothes for prominent dress outlets of the town now has its own store and a full fledged factory. Marked by embroidery done by the dexterous rural craftswomen, her dresses have experienced a growing sales figure since 2003. At Tohu's Creations you will also come across attractive panjabis and fotuas, children's wear, sarees and nakshi kanthas as well. Touhida's dresses have recently won two prizes in the Weekly 2000 fashion contest. Besides her dresses, she too has been awarded with the Best New Designer prize of the year. This recognition has only lifted the spirit of this budding designer and given her fresh hope to extend her business in the years to come. It must also be added that a portion of every purchase you make from Tohu's Creations will be donated to the destitute patients of Centre for the Rehabilitation of the Paralysed (CRP). So by being a client of Tohu's Creations you too can contribute your money to a good cause. Tohu's Creation is situated at House no 9, Road no 5, Sector 4, Uttara. Ramadan is already here, and people are slowly gearing up to prepare for Eid. The shopping spree will begin shortly if it hasn't already. As we move closer to the festival season, one would also expect the homes to be getting makeovers. Read on for a few ways to give the house a fresh look. Any beautician will tell you to clean your face before you get a makeover. The same principle works for the home makeover. Grab those mops and brooms and clean, clean, clean! Get the curtains and carpets washed, attack the furniture with a duster and polish, and give your decoration pieces a good cleaning to. You'll be amazed at what a little cleaning can accomplish. Tired of the same old layout for your living room or bedroom? Rearrange the furniture. Play with the placement of furniture until you're satisfied. It's possible to change the entire look of a room simply by moving a few chairs and tables around. Don't limit it to the furniture; if you have framed photographs, artwork and wall hangings on display, move them around to change the theme of your room. The easiest way to bring a dramatic change into the room is to change the soft furnishing. Put a fresh, brightly coloured tablecloth in the dining room. Throw on a different bedspread on your bed. Change the curtains. Viola! Your room is transformed. Invest in cushion covers. Throwing a few cushions around in your living room can add a much-needed dose of colour. The festival season will be bringing a lot of visitors to your home, so make sure your home is prettied up before the hordes get here. Start the makeover now, so that you can be ready well ahead of the big event!